Somehow it’s almost June. 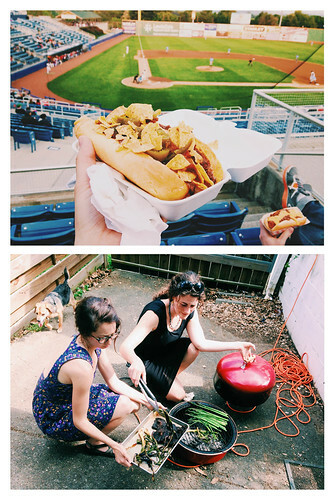 Somehow summer is here, along with her humidity-induced frizzy hair and cookouts and late night bike rides. Somehow spring slipped away and I’m not sure where she went. 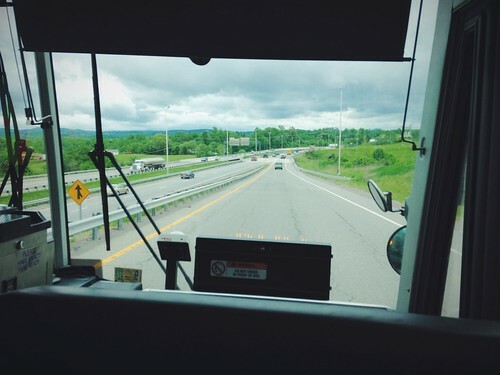 One thing I do know is that too many hours since February have been spent staring out the windows of this bus. That two hour commute? Still doing that. But it’s worth it for the job (it combines my love of writing/editing with environmental design–perfect, right?!) and, hello, the view isn’t shabby either. Look at those mountains! I get to watch them roll past every day, a definite upside to any long commute. And speaking of mountains, I’ve been trying to spend as much time as possible on two wheels. One of the things I’ve learned since leaving G is that it’s super important that whoever I partner with next be a cyclist. Like, the kind that will push me out the door and remind me that, yes, cycling makes me insanely happy (and healthy)–plus mountains and being outdoors, I need that. It’s not that G didn’t encourage me, but it was easy to slip into habits that didn’t include riding since he wasn’t that much into road biking and mountain biking was kind of an ordeal with him. 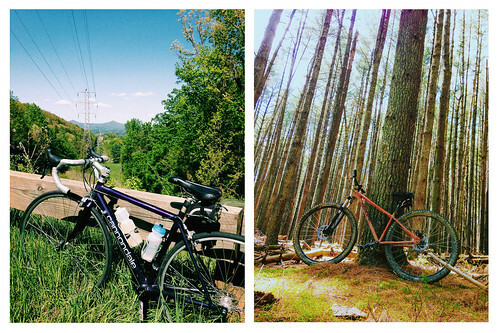 Whether it’s hitting the trails or riding along the Blue Ridge Parkway, I’ve been having a lot of fun rediscovering my town (and Blacksburg) one bike ride at a time and I’m hoping (fingers crossed) that by next year I’ll be up for some touring! 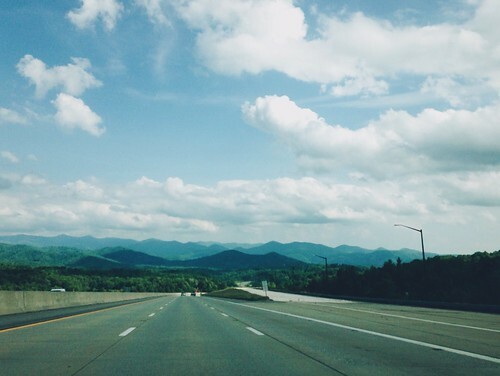 Maybe tackle a portion of the Blue Ridge Parkway? Compete in a few more races? I’m excited to see what the future holds. One trip was to Richmond where I spent a few days in our Richmond office (ooh lala, so adult to say that–god, I’m 27, I should probably get used to being an adult one day? No?) and spent the evenings mountain biking various urban trails and getting into mischief with random friends. Highlights? 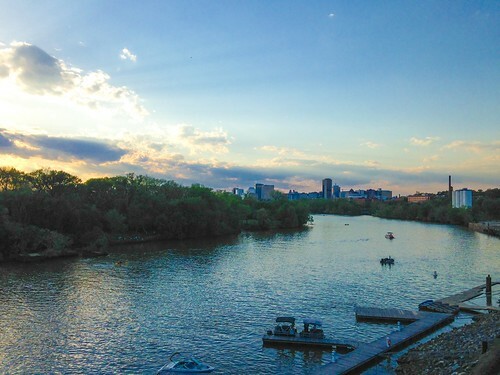 Definitely watching the sunset from the patio of The Boathouse–I mean, just look at that river! Those clouds! That skyline!–and finally checking out the South of the James farmers market on a Saturday morning. Why so great? Mostly because of Kitchenette and their incredible bagels (mine featured an everything bagel, jalapeno schmear, tomato, microgreens, basil, capers, and red onion–orgasmic, seriously orgasmic). I first saw the bagels on 17 Apart’s blog and knew that one day I would have to go find them. Turns out the market is maybe 2 miles from my uncle’s place so there was no way I was missing out this time! Can’t wait to go back and get another. And another. Totally worth the 20-30 minute line, trust me. A few weeks ago, though, on another trip to Asheville, I was poking around in a friend’s spice drawer (I’m so nosey, right?) and I pulled out a jar of a vibrant orange spice with some Farsi text written on top. It smelled intoxicating–a heady mix of earthiness and something floral with a lot of cumin mixed in–and it was hard not to be intrigued. “It’s seven spice,” A. told me, but he had no idea what was actually in it, and he sent me home with a jar to play around with. A bit of Google sleuthing and I’m still unsure of what exactly it is, but likely Advieh, a mix of turmeric, cinnamon, cardamom, cloves, rose petals or rose buds, cumin, and ginger. Like I said, a heady mix. It’s not a spice you mix with others–it’s a stand-alone–and I like it that way, especially given how lazy I’ve become with cooking lately. One spice to rule them all? Yup, I’m in on that. 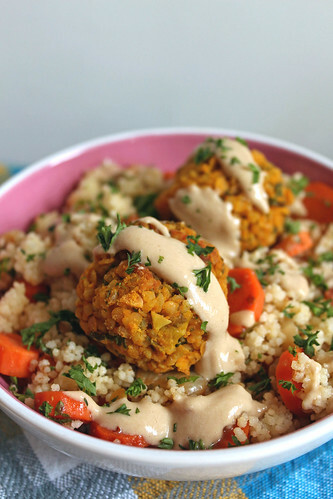 These lentil balls are so easy to prepare, it’s almost sinful. Cook some red lentils (the fastest of all the lentils), prepare the bulghur (ten minutes tops of boiling water mixed with it), sauté an onion, chop some parsley, form the balls and bake. There’s no shortage of vegan balls recipes on the internet, and I’m sure these aren’t particularly original, but, dang, they’re good. The seven spice really comes through and served with couscous and a quick tahini sauce, you’ve got a middle eastern-inspired meal in under an hour. In a small pot, bring the lentils to a boil in 2 cups of water and then lower to a simmer and simmer until cooked through. Meanwhile, in a separate pot, bring 1 cup water to a boil. Remove off the heat, stir in the bulghur, and let sit, covered, for 10 minutes or until the other components are ready. In a skillet, warm the olive oil over medium heat. Add the onion and carrots and sauté until the onions are translucent and the carrot is soft, 6-7 minutes. Add the parsley, salt, seven spice, and aleppo pepper, stir to combine, and remove from heat. Form the mixture into small meatball sized balls (2 tablespoons or so) and arrange on a parchment lined baking sheet. Bake at 375 for 15-20 minutes, flipping half-way through, or until golden brown. Serve with couscous and a tahini sauce. Jes, I’m so glad to hear from you! 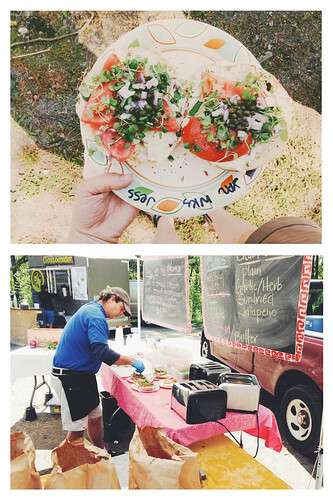 Gorgeous photos, delicious food. Happy Summer. Yayy! I almost thought these guys were falafel at first, but I think I like the idea of spicy lentils even better. And as long as you’re enjoying lots of travel, I say go for it! Also, no, no one ever feels like an adult. I’m, what, nine years older than you? And HA HA NO. It’s all good.